It has almost no mass, travels at essentially the speed of light, and has evaded scientific confirmation for three decades. Meet the neutrino, which scientists hope will help them answer dozens of critical questions about the universe, including why it’s full of matter. Neutrinos are produced when radioactive elements decay. They gush out of the sun, other stars, and even our own bodies. They also travel through huge amounts of matter without even flinching. 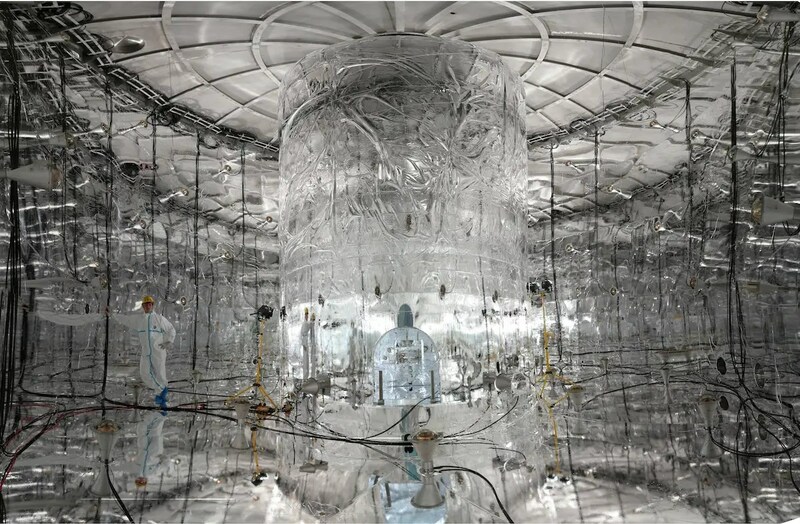 The GERmanium Detector Array (GERDA) looks for neutrinos by monitoring the electrical activity inside pure Germanium crystals isolated deep under a mountain in Italy. The scientists who operate GERDA are hoping to spot a very rare type of radioactive decay. When the Big Bang gave birth to our universe 13.7 billion years ago, it should have produced equal amounts of matter and antimatter, scientists say. And when matter and antimatter collide, they destroy each other, leaving behind nothing but energy. If the scientists are able to spot the decay they’re looking for, it could imply that a neutrino can be both a particle and an antiparticle at the same time, which would explain why the universe favored matter and why you’re here today. The Canadian Sudbury Neutrino Observatory (SNO) is buried roughly a mile underground. It was originally built in the 1980s but was recently repurposed to form SNO+. 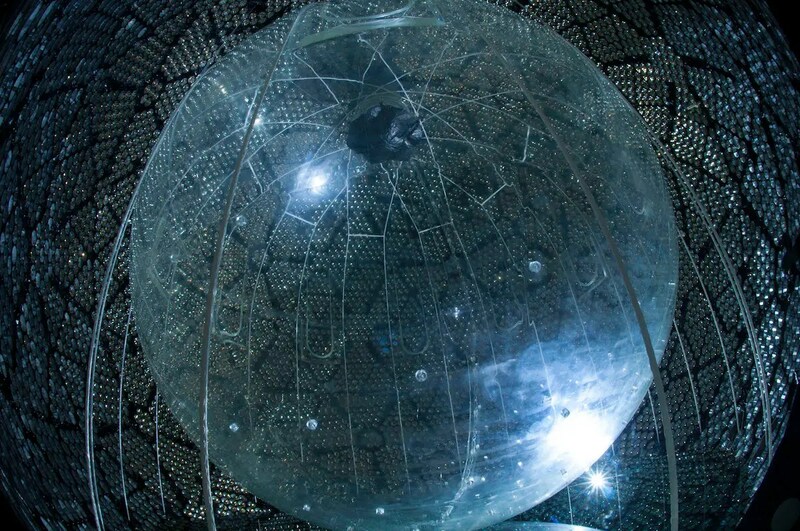 SNO+ will investigate neutrinos from Earth, the sun, and even supernovae. At its heart is a huge plastic sphere filled with 800 tons of a special fluid called liquid scintillator. The sphere is surrounded by a shell of water and held in place by ropes. It’s monitored by an array of about 10,000 extremely sensitive light detectors called photomultiplier tubes (PMTs). When neutrinos interact with other particles in the detector, they produce light in the liquid scintillator, which the PMTs are designed to pick up. 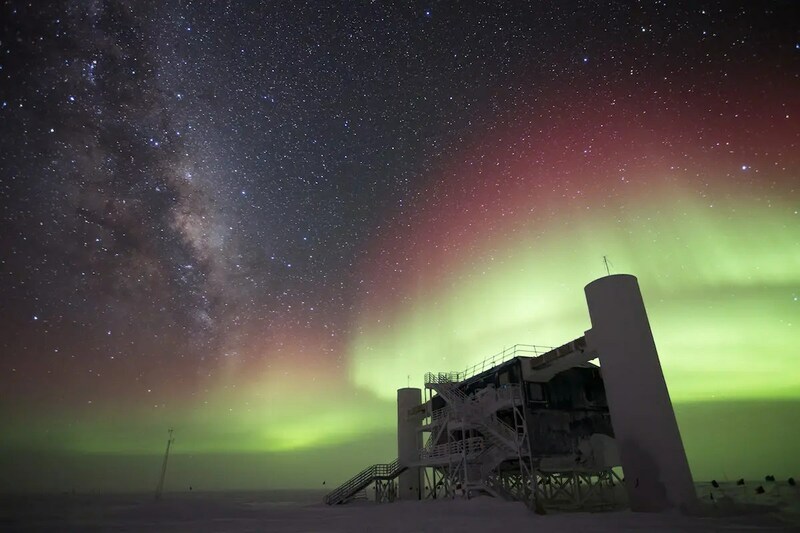 Thanks to the original SNO detector, scientists now know there at least three different kinds, or “flavors,” of neutrinos, which they change back and forth between as they speed through space. Meet the largest neutrino detector in the world. IceCube, located at the South Pole, uses 5,160 sensors distributed over a billion tons of ice to spot high-energy neutrinos from extremely violent cosmic sources like exploding stars, black holes, and neutron stars. When neutrinos crash into water molecules in the ice, they release high-energy eruptions of subatomic particles that can stretch as far as six city blocks, Symmetry reports. These particles move so quickly that they emit a brief cone of light, called Cherenkov radiation. That’s what IceCube’s detectors pick up. The scientists hope to use this information to reconstruct the path of the neutrinos and identify their source. Daya Bay is a neutrino experiment that uses three experimental halls buried in the hills of Daya Bay, China. Six cylindrical detectors, each containing 20 tons of liquid scintillator, are clustered in the halls and surrounded by close to 1,000 PMTs. They are submerged in pools of pure water to block out any surrounding radiation. A nearby group of six nuclear reactors churns out “millions of quadrillions of harmless electron antineutrinos every second.” This stream of antineutrinos interacts with the liquid scintillator to emit brief flashes of light, which are picked up by the PMTs. Daya Bay is built to investigate neutrino oscillations. Just like neutrinos, antineutrinos change between different flavors. Scientists at Daya Bay are trying to figure out how many antineutrinos evade detection at the farthest detector because they’ve changed flavors. 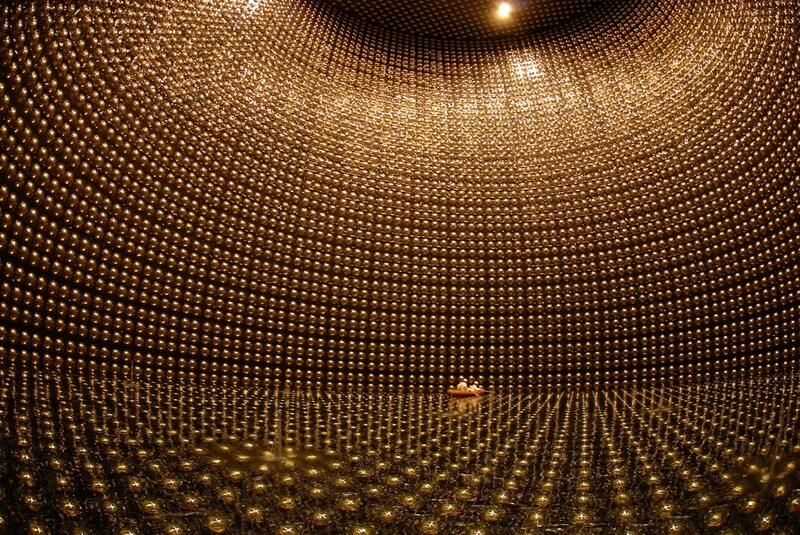 Super-Kamiokande (Super K) is a neutrino observatory a little over 3,000 feet underground beneath the mountains of western Japan. The massive detector contains 50,000 tons of pure water surrounded by about 11,200 PMTs, which staff must fix by boat. Similar to IceCube, Super K detects neutrinos using Cherenkov radiation. And Super K beat SNO to the punch in 1998 by being the first observatory to find strong evidence of neutrinos oscillating between flavors, which also showed that the tiny particles have mass. Now, its researchers are shooting an underground, 180-mile-long beam of neutrinos at the detector to further investigate these oscillations. 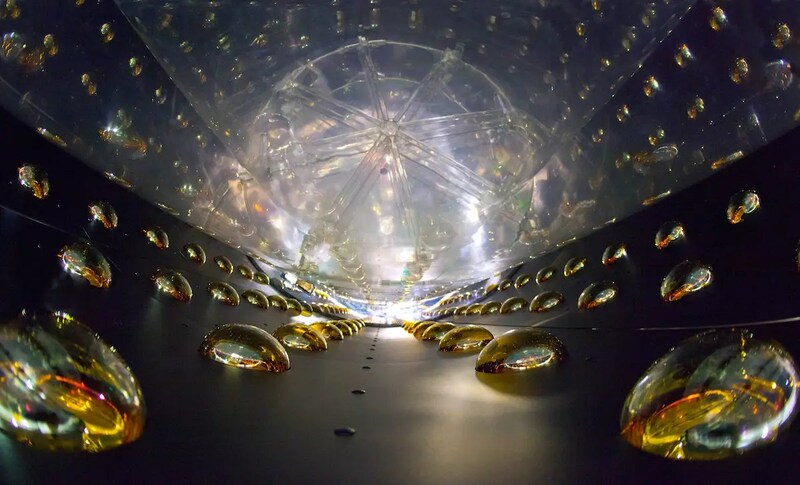 For another upcoming experiment, Deep Underground Neutrino Experiment (DUNE), scientists plan to send a beam of neutrinos roughly five times that distance.